Reșița (Romanian pronunciation: [ˈreʃit͡sa]; German: Reschitz; Hungarian: Resicabánya; Croatian: Ričica; Czech: Rešice; Serbian: Решица/Rešica; Turkish: Reşçe) is a city in western Romania and the capital of Caraș-Severin County, in the Banat region. Its 2011 population was 73,282. Reșița downtown and distant view of Govândari neighborhood. Panoramic view with the newest part of the city or Govândari. The name of Reșița might come from the Latin recitia, meaning "cold spring", as the historian Nicolae Iorga once suggested, presuming that the Romans gave this name to Resita, from a water spring on the Doman valley. A much more plausibile version, according to Iorgu Iordan, would be that the name is actually coming from a Slavic word: people living in the neighbouring village of Carașova 15 km away, referring to this place, that in those days was a similar village to theirs, as being „u rečice” (at the creek). It can also be noted that almost all Slavic countries have places with the name of Rečice (pronounced Recițe in Romanian). Historically, the town has its origins in the 15th century under the name of Rechyoka and Rechycha. Archaeological research found traces of habitation going back to the Neolithic, Dacian and Roman eras. It was mentioned in 1673 under the name of Reszinitza, whose citizens paid taxes to Timișoara, and by the years 1690–1700, it was mentioned as being part of the District of Bocșa together with other towns in the Bârzava Valley. The town was referenced to in the conscription acts of 1717 under the name of Retziza. On 3 July 1771, it became an important metal-manufacturing center in the region. The foundation of the industrial Reșița were laid with the establishment of factories near the villages of Reșița Română (Reschiza Kamerală or Oláh Resitza) and Reșița Montană (Eisenwerk Reschitza, Német(h) Reschitza or Resiczbánya). Reșița Montană was at first inhabited by Romanians[dubious – discuss][need quotation to verify], and later, in 1776, 70 German families settled there. Between 1880 and 1941, Germans were the dominant population in the city, with as many of them as 12,096 residing here in 1941, as opposed to 9,453 Romanians, and 1861 Hungarians living here in the same year. Between the years 1910–1925, Reșița had the status of a rural area, and in 1925, it was declared a town thanks to its development to a powerful industrial location in modern Romania. In 1968, it became a municipality. After 1989 Reșița lost most of its importance and its economy faced a drawback, along with the Romanian economy. The population also suffered a decrease, dropping from 110,000 in 1989 to 86,000 in 2006. After the fall of communism, the Reșița Steelworks (Combinatul Siderurgic Reșița, CSR) were bought by an American investor who brought the factory just one step away from bankruptcy. Today the steelworks are run by TMK Europe GmbH, a German subsidiary of the OAO TMK, Moscow, who has projects of modernization for the CSR. Still, it is believed[by whom?] that CSR will never again reach the status it had in the communist era. The city is situated along the Bârzava river, which meets the Doman river in the centre of town. Most of the urban area is concentrated along the Bârzava, with some development—mostly residential—in the surrounding hills. It is made of three main areas, two former villages that were very close: Romanian Reșița (Romanian: Reșița Română or Olah Resitza) and Highland Reșița (Romanian: Reșița Montană, Eisenwerk Reschitza or Nemet Reschitza); a new area, recently built, made of tower blocks on a wide opened meadow, called Bârzava's Meadow. The Civic centre of the city has been partially renovated in 2006. An important point of attraction located in the City Centre is the impressive kinetic fountain designed by Constantin Lucaci, built in the communist era. There are also important cultural points in Reșița that have been renewed in 2006, including the Concrete School Școala de Beton), Downtown and the Polyvalent hall (Sala Polivalentă). The Reșița Steam Locomotive Museum features Romania's first locomotive built in Romania at Reșița in 1872, and is located in the open-air museum in the (Romanian: Triaj) neighborhood. An important iron and steel center, Reșița is the site of blast furnaces, iron foundries, and plants producing electrical appliances, chemicals and machinery (see Reșița works). The city administers six villages: Câlnic (Kölnök), Cuptoare (Kuptore), Doman (Domány), Moniom (Monyó), Secu (Székul; Sekul) and Țerova (Krassócser). Also, the city is a hub for leisure locations all around. Locations near Reșița include the ski resort at Semenic, Lake Gozna, Lake Secu, the Trei Ape Lake (Three Rivers Lake), Gărâna, Brebu, and Văliug. Catholic Church in Reşiţa dedicated to Our Lady of the Snows. Reșița has long been considered as the second-largest industrial center of Romania. It is an important center in manufacturing steel and vehicle manufacturing. C.S.R. (Combinatul Siderurgic Reșița) and U.C.M.R., the first Romanian factory (Uzina Constructoare de Mașini Reșița). The two are called as Reșița works and are the factories which sustained the city's life for more than 300 years. The first factories were built in 1771, during the reign of Maria Theresa. During the 19th century, the steel works were known as StEG. 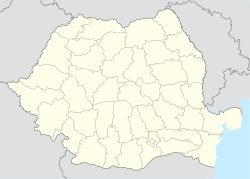 After the end of World War I, when Banat became part of Romania, they changed their name again, this time to Uzinele și Domeniile Reșița or UDR (Reșița Works and Domains). Only later, under the Communist regime, did the UDR split to CSR and UCMR. The economy of Reșița has faced a drawback since 1989, but began recovering as investment is on the rise. Tourism: 2 tourism societies (Tourist Semenic SA and BIRTA SA). Reșița currently has 6 supermarkets of which two Carrefour supermarkets, one Lidl supermarket, one Billa supermarket, one Lidl supermarket and one Kaufland near the road entrance from Bocșa. The Shopping Center of Reșița is called Nera Shopping Center located in the Civic Centre. There are a variety of companies operating in Reșița, offering almost everything a normal consumer would need. There are some other shopping centres currently under development such as Reșița Shopping City located on the site of the old thermal plant, or the mall of the Mociur area. Boulevard crossing in downtown (2007). Reșița's public transport relays on 6 bus lines, and was operated by the actually defunct Prescom company. It is now operated by TUR. Reșița's bus fleet was to be upgraded sometime during 2009. Trams have been decommissioned. As of 2008 the new mayor announced his intention to decommission all trams and replace them with modern buses complying with EU standards. The 2 Tram Lines were Renk-Muncitoresc line (0), and Renk-Stavila line (DP) which was basically an expansion of the Renk-Muncitoresc line, but there were only 3 trams on this line. The full tram fleet was consisting of about 28 trams. The last trams were GT8 models imported from Germany, and fully replaced the former pre-89 trams in 2002. In 2017 it was announced that a new company was created to deal with the public transportation problem, called Transport Urban Reșița (TUR), consisting of a bus and tram fleet of modern standards for its passengers, bringing a new and efficient transportation system back to Reșița. Reșița features a main 4 lane road that connects the neighbourhood Stavila to the neighbourhood of Calnic. This main road passes through almost all important neighbourhoods in Reșița. The rest of the neighbourhoods in Reșița are accessible via 2 lane secondary roads or single-lane roads. Roads of Reșița are usually well maintained, especially the main road, but there are occasional pot-holes on secondary roads. The road signs are usually well placed and well maintained, and traffic is usually friendly and traffic jams are a myth. Accidents are very rare and almost never lethal. Externally Reșița is connected by national roads to Caransebeș (Continued to Bucharest) and respectively Timișoara. There are also 3 county roads connecting Reșița to Oravița, Năidaș and respectively Anina. ^ "Începuturile Reșiței". istoriabanatului. 17 June 2009. Retrieved 24 June 2011. ^ a b "Historamic view over Reșița downtown". History Pin. 18 June 2010. Retrieved 23 December 2013. ^ "Ethno-demographic Structure of Romania". The Ethnocultural Diversity Resource Center. Retrieved 2 January 2011. ^ Țiglă, Erwin Joseph (2004) . "Resita Montana". In Konig, Waldermar. Biserici Romano-Catolice din Arhidiaconatul Montan (in Romanian) (a doua ed.). Reșita: ColorPrint Reșita. p. 110. ISBN 973-97258-5-6. ^ "Bus schedule" (PDF). istoriabanatului. 1 February 2011. Retrieved 24 June 2011. Wikimedia Commons has media related to Reșița.